Discover America's third coast - the Great Lakes of Michigan, Superior, Erie, Ontario and Huron. 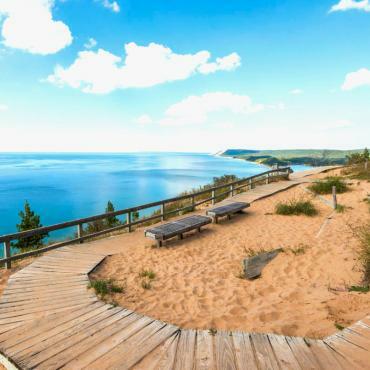 This region, compromised of eight states (Michigan,Illinois, Indiana,Wisconsin, Minnesota, Pennsylvania, Ohio and New York) plus the Canadian province of Ontario - covers more than 4,000 miles of coastline across five lakes, two time zones and more beaches than you'll have time to explore. Plus, there's layers of Americana you won't find on either the east or west coast. And, as Americans themselves say, the nicest people live in the middle! 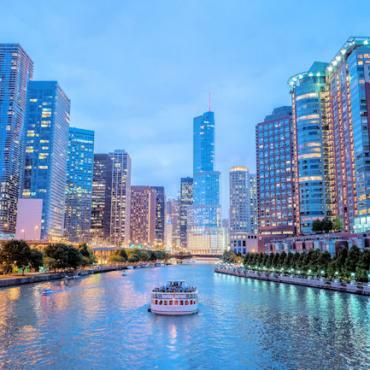 Our easy itinerary, circling Lake Michigan, is the perfect introductory holiday to this area and includes three of the five lakes. Welcome to Chi-Town! You have two nights to explore the city Al Capone once ruled and where the skyscraper began. The John Hancock Building's 360 Observation Deck and Ledge at Willis Tower are musts. Chicago is also the official start of Route 66 and where Adams Street crosses Michigan Avenue, you can take your picture with the start of route sign. 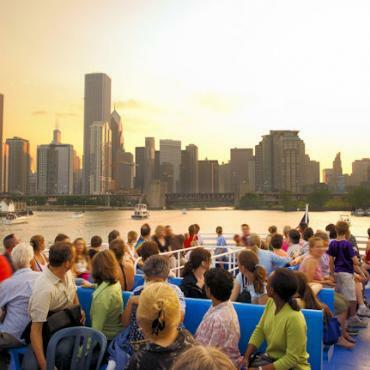 For your first glimpse of Lake Michigan, head to Navy Pier. Built in 1916, the pier stretches over 3,000 feet from the shoreline and is chock full of restaurants, shops and tours. 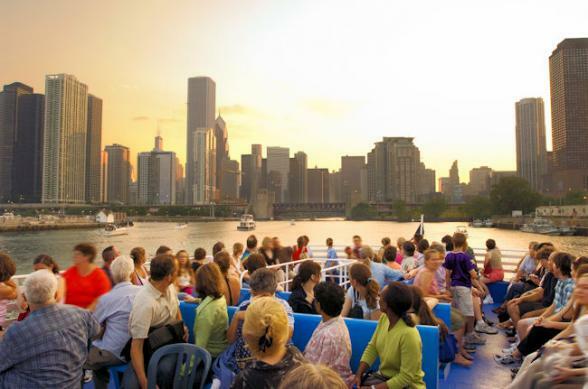 One of our most popular city tours is Chicago with a Cop! Our ex-policeman, Dennis, walks you through the city and shares loads of local knowledge and stories you won't hear elsewhere. We'll happily pre-book this for you. By night, there is plenty of entertainment and lots of clubs featuring Chicago-style jazz. 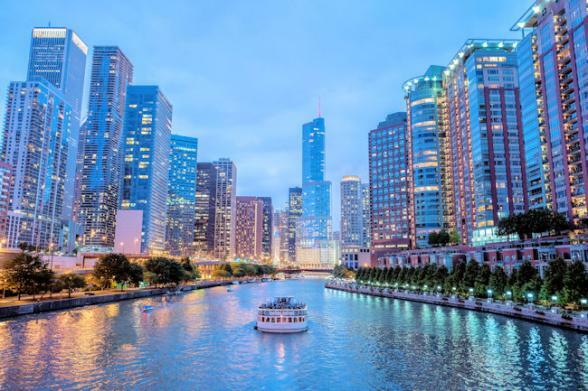 Exploring the city is bound to stir up a hunger and Chicago is home to every type of cuisine imaginable. The deep dish pizza pie is the local favourite though and the competition for best pizza is a tough one. If you are passing by Gino's, Giordano's, Pizzeria Uno or Lou Malnati's you have to give it a go. Say farewell, for the moment, to the state of Illinois and pass through Indiana before crossing into Michigan. Your scenic drive along Lake Michigan will take you through quaint American towns like New Buffalo, St Joseph before you arrive into Lakeside. 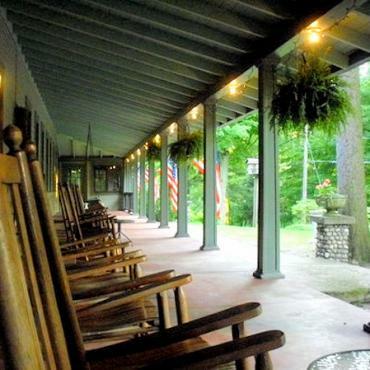 Lakeside is a sleepy community full of antique shops and one-off boutiques. 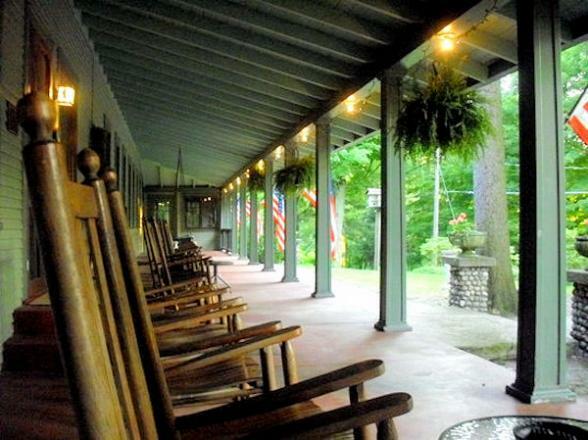 A favourite place to stay is Lakeside Inn. There's a path to Lake Michigan right across the street and you can walk the beach for miles. Be on the lookout for sea glass - this is a popular spot for it. Our recommendation for dinner - Red Arrow Roadhouse. There's always a great vibe and the food is delicious. Another leisurely day driving along the only Great Lake entirely located in the United States. Get out and stretch your legs and enjoy the Lake Michigan scenery. Named 'The Happiest Seaside Town' by Coastal Living, Grand Haven, is one of the most historically significant areas in the state of Michigan, with its history dating back over 300 years ago. Imagine what the area was like in the 1700s and 1800s when fur trading and lumbering were king in West Michigan. 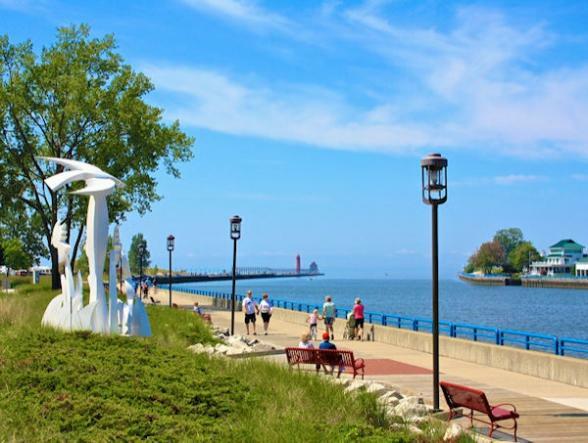 Experience the history of the area by taking a walk along our 1.5 mile boardwalk that spans from downtown Grand Haven to Lake Michigan. At the end of the boardwalk you’ll see two lighthouses that have guided ships for years and whose silhouettes at sunset make the perfect backdrop for photos and memories. Meander through the Tri-Cities Historical Museum’s Akeley Building to learn the history through photographs and fun exhibits that will give you an old time feel. Leave time to head for the beach. This part of the USA is blessed with beautiful beaches and Grand Haven is famous for its singing sands, a unique phenomenon to Western Michigan. Take a walk and listen for yourself! It's a scenic highway all along Lake Michigan today to Traverse City. On a hot summers day the beach at Arcadia is the perfect spot to break the journey for a picnic and a swim. Be sure to stop too just north of Arcadia at Inspiration Point for a spectacular view from a bluff over the lake. Traverse City region boasts 180 miles of beaches, over 40 wineries, and of course, Sleeping Bear Dunes. Referred to as 'mountains of sands' these dunes are one of America's most profoundly beautiful landscapes. 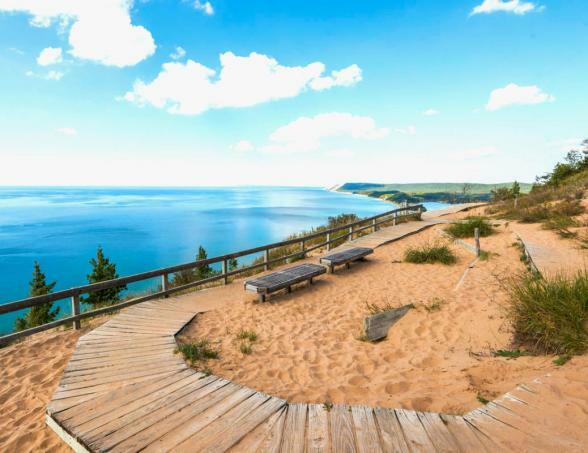 Take the Sleeping Bear Heritage Trail and discover wilderness islands, freshwater beaches and over 60 miles of sweeping vistas. In the evening head to the State Theatre, this Art Deco masterpiece dates back to the silent film era, check out the city's art galleries, or enjoy dining on the waterfront. Michigan is divided into two regions - the Lower Peninsula and the Upper Peninsula. 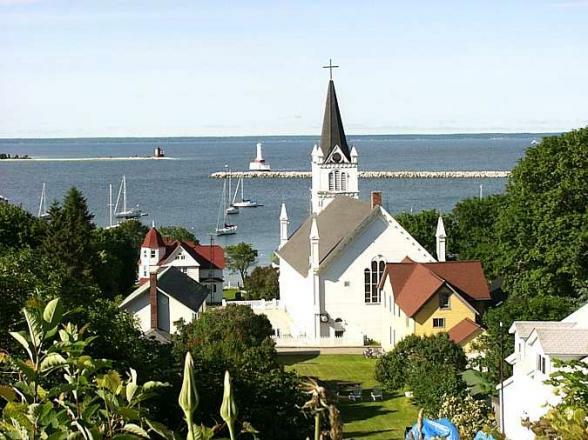 Today, you're off to the northern-most point in the Lower and gateway to the Upper - Mackinaw. Mackinaw City's main street is packed with unique stores and restaurants. Golf, fish, explore. Or, relax in the parks or on the beaches – you are on holiday after all. 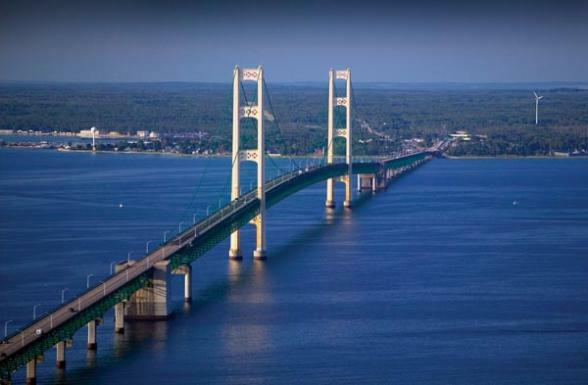 One sight not to miss (and you’ll be driving over it soon) is the 5 mile Mackinac Suspension Bridge which joins the two peninsulas of Michigan. 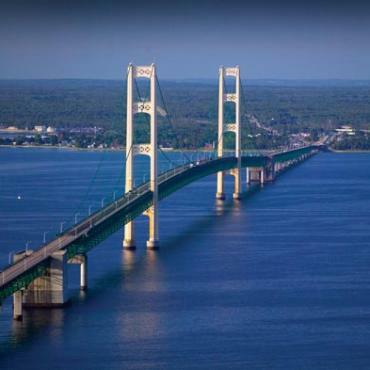 The bridge is affectionately referred to as Mighty Mac and is the longest suspension bridge in the Western Hemisphere at 26,372 feet long. The bridge crosses the Straits of Mackinac the area where Lake Michigan meets Lake Huron. Be sure to make the trip out to Mackinac Island, on Lake Huron. A 15 minute ferry ride transports you to a place considered sacred according to American-Indian tradition. All transportation is by horse and buggy, bicycle or foot. Start with a carriage tour around the island – then rent bicycles and enjoy the trails of the Mackinac Island State Park. In the heart of downtown, you’ll find plenty of places to eat and shop and be sure to visit the Haunted Theatre. Then jump back on the ferry for a sunset trip back to the mainland. From the Lower Peninsula to the Upper Peninsula, today’s journey starts with the stunning drive across Mighty Mac. Enjoy the natural beauty of the drive which will take you through the Seney National Wildlife Refuge, home to over 200 species of birds. 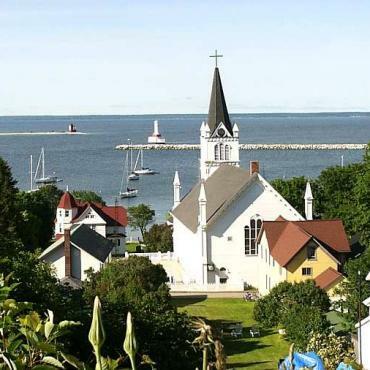 Marquette, the largest city in the Upper Peninsula, is friendly and energetic - the perfect blend of urban and rustic. It sits on Lake Superior's coast (your third Great Lake!) which is the largest of the Great Lakes and the largest fresh water lake in the world. Pass through Escanaba, a waterfront community, before entering the state of Wisconsin and your first stop Green Bay – home of the Green Bay Packers American football team. As the only community owned football team in the USA, no other city is as closely associated with a sports team as Green Bay. If you're an American football fan this city is a must stop. 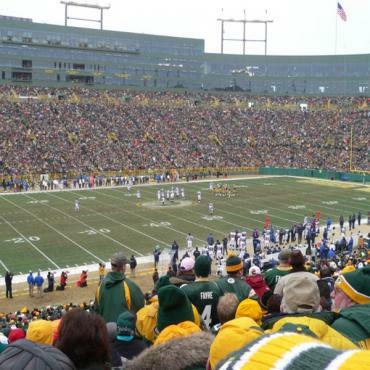 Tour the Packer Hall of fame and Lambeau field. Now it’s just 45 minutes to Sturgeon Bay in scenic Door County. 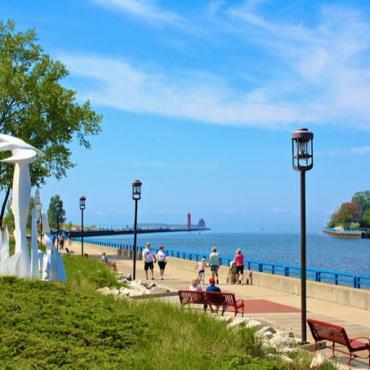 Situated along Green Bay, an arm of Lake Michigan, you can swim, fish, sail, golf, pick cherries, hike, shop the farmer’s market, or tour an art gallery – take your pick the day is yours. 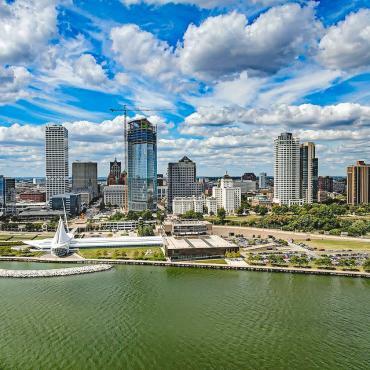 Milwaukee – home of Happy Days, Harley Davidson, Miller Brewing Company, the Milwaukee Brewers major league baseball team, and the largest music festival in the world – Summerfest. 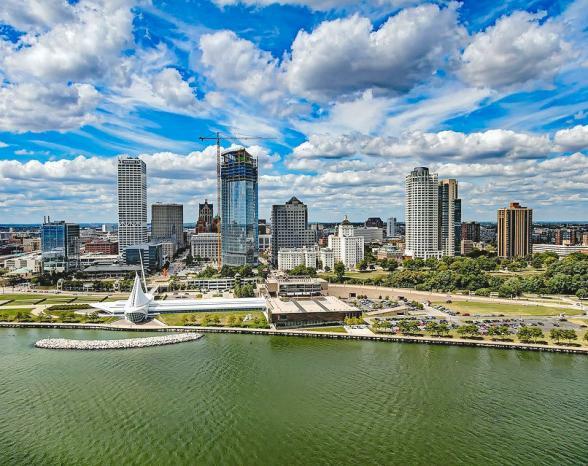 Whatever you do, make sure to visit the Milwaukee Art Museum (MAM). Set right on Lake Michigan, the building itself is awe inspiring and the collections impressive. Also plan to visit the Historic Third Ward, adjacent to downtown. A trendy rejuvenated warehouse district, which is listed on the National Register of Historic Places, it offers trendy art galleries, restaurants, speciality shops and the Milwaukee Public Market. Baseball fans must see a game in Miller Park, the stadium is state of the art and the beer is cold. Miller Brewing Company (now officially MillerCoors) is open year round for tours and if that isn’t enough, in the summer there is a festival on Lake Michigan nearly every week. We’ll be sure to inform you on what’s going on before you go. Gurnee Mills Outlet Mall is a shopper’s paradise and located half way between Milwaukee and Chicago. 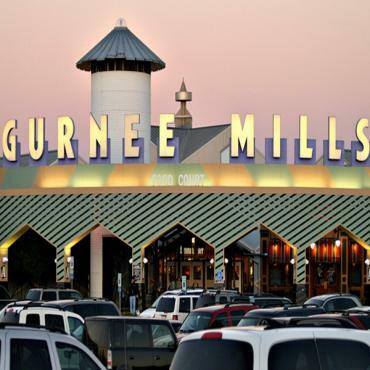 With over 200 stores, attractions, and restaurants, it's a perfect midway stop. Prefer roller coasters to retail therapy? Six Flags Great America is also located in Gurnee and home of the world’s tallest and fastest racing wooden coaster! AND, it's a double track which means two trains can fly through this 4,650-foot-long run at the same time....you know you want to! With an evening flight home from Chicago, tomorrow, there is no rush, so spend the day as leisurely as you like. Not ready to go home? This holiday can be tailored anyway you like. A bit of Route 66 maybe? Time in Detroit?